American Litho Color offers our very own Eagle Giclees. They are the culmination of over 40 years of fine art reproduction experience. We apply the same exacting standards of color separation we have used to produce limited edition lithographs since 1971 to the giclee process. Request a quote to have an Eagle Giclee printed of your favorite painting or other 2-D artwork. 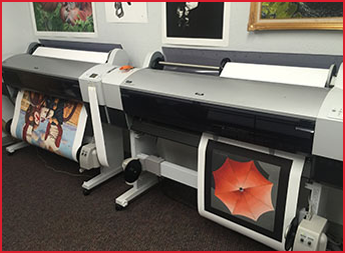 At American Litho Color, our printing process involves only the finest materials. Choose from archival canvas or acid-free fine art paper to produce your prints. For these fine-quality medias, we add a six-color, UV archival ink set that boasts a longevity rating of up to 150 years. Further longevity and durability for canvas can be added by selecting from gloss, semi-gloss, or low-gloss coatings that were custom developed for our process.